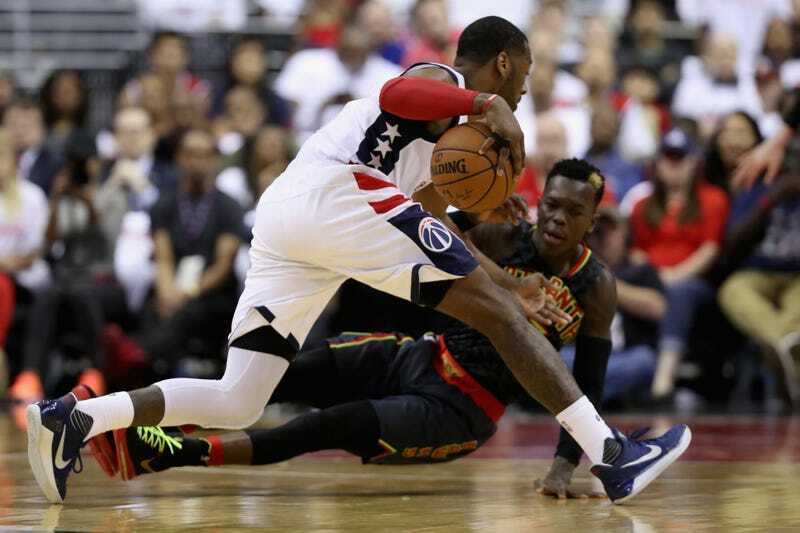 In the most entertaining individual performance of the NBA playoffs thus far, John Wall seemed hell-bent on proving that no perimeter defender on the Hawks can stay in front of him for longer than two seconds. Dennis Schroder, who bore more of the responsibility, spent a lot of this game backpedaling and getting roasted. Kent Bazemore, who also chipped in, struggled to stay on his feet. When he did, he was dancing. If you give Wall a split-second of inattention, he’ll be at the rim by the time you turn around. By the time Wall hit his virtuosic third quarter, he started feeling his jumper, and at that point there’s very little to be done. When Wall weaseled his way to the hoop, the softest Dwight Howard in recent memory offered very little help. Howard also frequently lost track of Marcin Gortat rolling to the rim (and feasting on Wall lobs), and he finished with a Hawks-worst plus-minus rating of -21. Atlanta, a good defensive squad that ranked fourth in defensive rating this season, can either throw their hands up and eat whatever Wall serves them each game, or make some significant adjustments, because Bazemore and Schroder looked helpless for long stretches of Game 1. Given how taxing it is to check someone with this kind of raw foot speed and guile, these defensive duties might be best spread across a few players. Notably absent from the Hawks’ rotation was Thabo Sefolosha, whose perimeter defense and length might prove useful here; he’s recovering from a groin strain, but coach Mike Budenholzer said he’s healthy. In his stead the Hawks started Taurean Prince, a springy rookie who looked solid on Bradley Beal, and who could probably handle Wall in small doses. Or maybe they just have to accept that Wall’s assaults can’t really be contained, and do their best to win the other matchups. 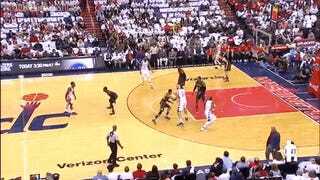 —and came out with an improbable finish, or a dead-on pass, as as he did here while sailing out of bounds, finding an open Otto Porter to drain the three. Watching John Wall make these difficult decisions—in ridiculously close quarters, at ridiculously high speeds—will be one of the main pleasures of this week, and reason enough to keep up with a first-round series that would be easy to write off in favor of juicier matchups. If there is any moment in basketball more invigorating than the instant that John Wall starts his tornado-spin into the lane, you are welcome to write me a nice letter and let me know.